A challenger brand selling Latin Flavour sauces & seasonings into 738 Sainsburys & Waitrose outlets. Capsicana was founded 9 years ago by Ben Jackson. Today Capsicana Latin Flavour sauces and seasonings are sold in 738 Sainsbury's, Waitrose and Whole Foods stores across the UK. The group's first PrimeStox offer earlier in 2018 was a succcess. Now they are returning to raise £50k to fund the production of 50,000 more packs and to achieve two new major listings by the first quarter of 2019. In return the company is offering PrimeStox investors repayment in just 9 months plus a profit of 9.4%. You'll also become a Friend of the brand. Capsicana Returns successfully raised £50,000 to fund the production of 50,000 packs 235 days ago. Check back soon for more offers. The idea for the name Capsicana came to Founder Ben Jackson as he was working one night at 2am. Why not combine "Capsicum" a name for South American chillies, and "Mexicana"? So was born Capsicana! The company's first offer on PrimeStox was in February 2018 and it was a success. Capsicana repaid early. The funds were used to launch several new products into Sainsbury's. These include two varieties of seasoning, a new sauce flavour (Tomatillo) and a Guacamole Mix. These are selling well. Since its last offer Capsicana increased its distribution and stocking points by 44% and strengthened its Board and Management team. The company has grown but Ben remains devoted to his goal: popularising the Peruvian, Brazilian and other Latin flavours he savoured with his father in his youth. Ben's favourite sauce is the Capsicana Chilli & Honey Cook Sauce. 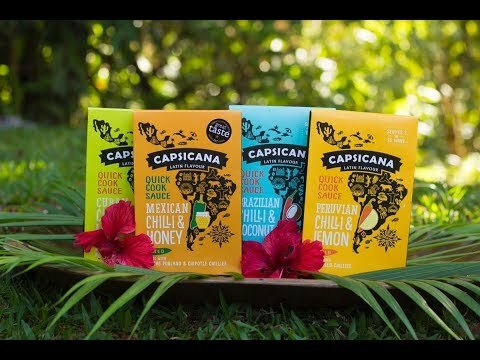 Capsicana is requesting the support of PrimeStox investors to raise £50,000 to fund the production of 50,000 packs of Capsicana products, across their product range. Their successful first offer was in February. The company will also expand distribution. Capsicana expects to list with two more top-4 UK retailers in the next 6 months. The funds will also pay for new product development. The company has advanced plans for certain new Capsicana products, launching in the first quarter of 2019. In return Capsicana is offering repayment in just 9 months plus a profit of 9.4% for standard investors or 10.1% PRIME. Today Capsicana is selling approximately £27k per month and forecast sales are £78k per month by March 2019. This growth is based on the strong registered sales of Capsicana's new and existing products. Capsicana's current funding request represents less than 2 months of current sales and less than one month of expected future sales. In addition, participating PrimeStox investors will become Friends of the Capsicana brand.